Who can join the Christmas Day Lunch? 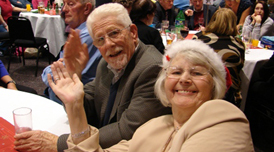 The Christmas Day lunch is open to anyone in Fareham who will find themselves alone at Christmas or isolated by caring responsibilities and would enjoy a day out. This is a completely free of charge day for all who attend, although donations are welcomed to support the event for the future. Booking has closed for 2018. Guests arrive by 12noon. A 3-course lunch with wine is served from 12:30 followed by carol singing and a raffle. After tea and mince pies, guests begin to leave, taking with them a plated tea and a wrapped gift. This year there is a lunch at one venue on Christmas Day. If you cannot get there yourself, we can organise door to door transport to get you there on time and safely home again. Please click here for a link to download a booking form (PDF). Or click here to use our on-line booking form. Booking has closed for 2018. The Christmas Day lunch is co-ordinated by Community First (Fareham). It is funded entirely by donations from the local community and is run by volunteers on the day. Volunteers: Our volunteer vacancies have all been filled. Thank you for your interest. Donors: We welcome donations of food, small gifts, table decorations and cash. To avoid duplication leading to waste, we publish a shopping list here. Or call 01329 231899 to offer support. You can make a commission-free cash donation through our My Donate page. Do you live in Portchester or Stubbington?